– Zones of Concern (no fewer than 1,100 dispatched events) at Higgins and Main and along Portage near Portage Place Mall. – High intensity zones at Main and Henry, and along Portage near Portage Place Mall. – Zones of Concern in Central Park and along Main to about Euclid and Main at Henry. What do the maps appear to say? 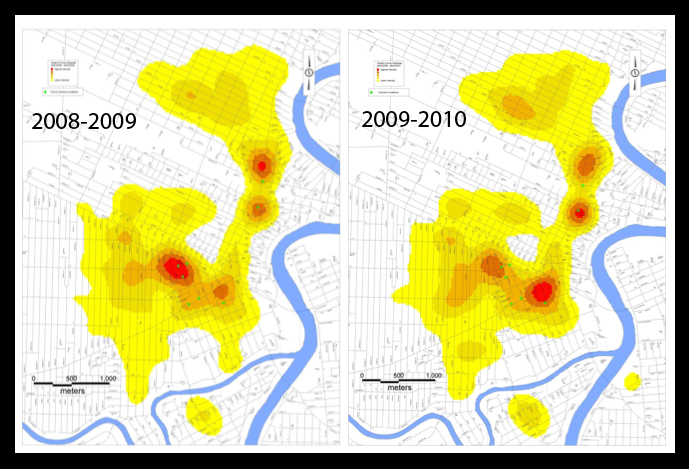 These maps were embedded in a report on the effectiveness of the WPS’ crime camera pilot project. You can read about what it says here. The precis version is that technological hiccups may have limited how effective the cameras can be, and there’s [apparently] no conviction results yet (from 2009? really?) to measure if the footage is holding up in court. That’s quite a revealing map. The fact that the brightest red dot seems to centre on Portage Avenue comes as a surprise to me – I never would have thought that it’s such a crime hotspot.